Fact: Rosario Dawson is a hilarious photobomber. 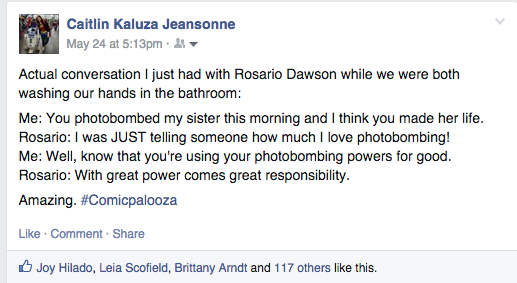 My sister is a die-hard Rosario Dawson fan (she actually spent the night before this year’s Comicpalooza 2015 watching Josie and the Pussycats to prepare for being in the same room with Rosario). On Sunday, we were standing in the middle of the long line to see Stan Lee (who was amazing) as it snaked its way through the hallways of the George R. Brown Convention Center. We happened to be standing in the very furthest hallway of the convention floor (aka the hallway they walk the celebrities down when they’re headed to the main stage). My sister was standing with some other cosplayers about to get her picture taken when Rosario Dawson happened to walk by, sneak up behind her, and photobomb her photo. Amazing. The best thing about the experience is that from where I was standing I could see Rosario heading Ellen’s way, but Ellen didn’t even realize it was Rosario until she had walked away. At which point she about fainted with joy. Me: You photobombed my sister this morning and I think you made her life. Rosario: I was JUST telling someone how much I love photobombing! 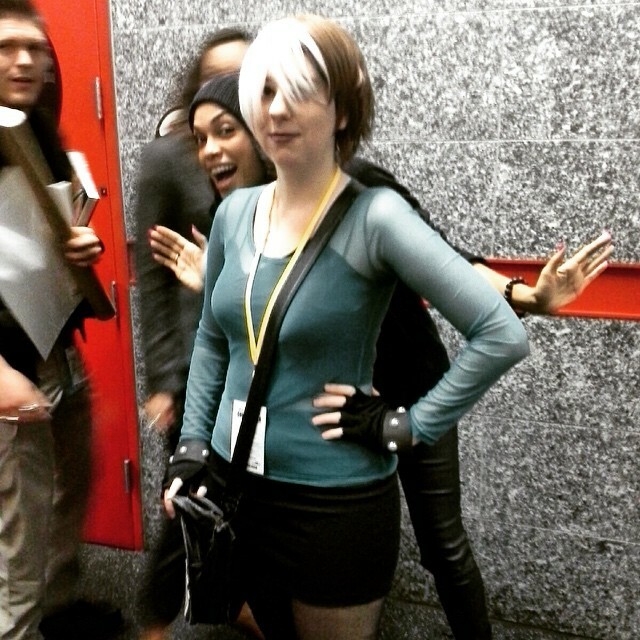 Me: Well, know that you’re using your photobombing powers for good. Rosario: With great power comes great responsibility. Here’s to you for being awesome, Rosario!